This week in Old School we have, as always, got a number of quality of life changes as well as a rework of the way slayer tasks are assigned. Let's get into the details. We have reworked the slayer assignment tables to remove bad tasks, unnecessary requirements and have altered the weighting of certain assignments. The rewrite of the assignment system allows us to add tasks in a way that doesn't have a large impact on the rate at which all other assignments are given. With the previous system, some tasks ended up being so rare that you would almost never see them. We have also removed the combat level checks on all tasks, although the combat level requirements on slayer masters remain. For example, players under 110 combat would previously not have been able to receive a dark beasts task despite being capable of killing dark beasts and meeting all other requirements. We have now removed all combat level limitations for assignments. Gargoyles, nechryaels, abyssal demons, spiritual mages, spiritual rangers and spiritual warriors can now be assigned by Vannaka. Chaeldar will now assign between 110 and 170 spirit creatures and aviansies. Removed a number of terrible assignments from Duradel. Duradel will now assign between 130 and 200 nechryaels, spiritual mages and spiritual rangers. 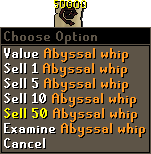 Nieve can now assign between 10 and 20 black dragons. Nieve can now assign dark beasts. If you have any feedback following these changes to the slayer assignment system please let us know. We will continue to tweak the slayer assignment system to be appropriately balanced for Old School and to the liking of the community. Your feedback is key in making this happen. We have increased the number of spawns for several popular monsters. The blue dragons and black demons found in Taverly dungeon now have extended areas with some extra spawns. The red dragons and baby red dragons found in the Brimhaven dungeon have also had their area expanded and a few new spawns added. In addition to adding new spawns for existing monsters, we have added a new type of monster in Brimhaven dungeon: baby green dragons. They can be found east of the fire giants. It is possible to quickly access the baby green dragons by climbing up a vine found to the north of the cave, right by the entrance. This vine requires 87 Agility to climb. These baby dragons will allow slayers that receive a green dragon task to trade a bit of experience and profit for extra safety. When selling items to a shop you now have the option to sell 50 at a time. This should help make the process of selling items to stores a whole lot smoother if you are trying to sell large quantities. It should be noted that a "Buy 50" option has not been added alongside this. A shortcut into the Kharazi jungle which requires 79 Agility and access to the Legends' Guild to use has been added just east of the entrance to Shilo Village. 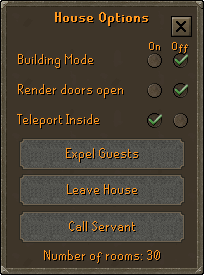 It is now possible to toggle whether teleporting to your house will place you inside your house or by the house portal. This option can be found in your house options in the settings tab. The smithing experience granted when mining granite or sandstone with the infernal pickaxe has been tripled. Adding a spotted cape to your PoH cape rack will no longer cause issues with getting capes out of it again. A cutscene in the King's Ransom quest has been fixed, it was cutting off King Arthur's poor head. Fixed a render order issue on Dharok’s helm. Resolved a clipping issue on the Kandarin Headgear 2 and 3. All trail combat NPCs now cannot prevent a player from being attacked by a player inside a single combat zone of the wilderness. All trail combat NPCs now also do not allow a player to be attacked by several players at once in a single combat zone. NPC's will no longer sometimes turn invisible on the south west tile of a Dwarf Cannon. It is no longer possible to use the Jutting Wall entrance to the Wilderness GWD to avoid damage. Resolved an engine issue causing players to turn invisible. The Slayer changes are interesting. John C provided us with a list of task weights before the rework, could we see a list of task weights after the rework? This would reduce the amount of testing required and allow players to more quickly assess the consequences of this update. Been getting great task selection pre-rework, hopfully it isn't made worse.